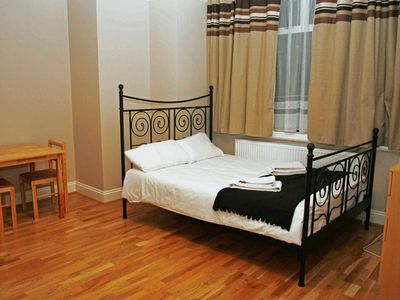 Large Studio Apartment for max 4 people (#S1) is in Willesden Green (zone 2) – a thriving area located in North West London on Jubilee Line. This widely diverse area is popular among renters, students and holiday makers, as well as young professionals for an affordable short term accommodation. This is a PRIVATE FLAT with its own kitchen and en-suite bathroom. You can’t beat the Jubilee line and the buses out of Willesden Green travel in every direction around or across London. Green Park, Hyde Park: 20 min. Big Ben, Westminster, London Eye: 30 min. M&M Worlds, Leicester Square: 30 min. BAPS Shri Swaminarayan Mandir (Neasden Temple): 30 min. London Bridge, The Shard, Borough Market: 30 min. Tower Bridge, Tower of London: 35 min. Emirates Air Line, O2 Arena: 50 mins. Westfield (Shepherd’s Bush): 40 min. Please, check our HOUSE RULES or General Terms & Conditions to get more info about our services.